We are in the final stages of completing Sunshine Designs, Inc.’s website, a custom log home builder whose clients include elite home owners. Check out the site to see if you recognize anyone in the first gallery. Wink, wink…he goes fast and turns left every week. Just Announced! graphXevolution ReDoing Hawley Winterfest Website! graphXevolution, the people responsible for the Downtown Hawley Partnership website will be redoing their sister website Hawley Winterfest. graphXevolution was responsible for the interim website but will be recreating a new look, with tons more functionality including a visitor itinerary module and photo and video gallery. We are very excited to be working with the organization and know that the new website will propel the event to a new level. Check out the Downtown Hawley Partnership website here: http://www.visithawleypa.com. If you’re interested in having us visit your site, and seeing how we can propel your web presence to the next level, drop us an email or call 570.647.8301. We CAN make you as big as Walmart! How is that for an opening line? The internet is a beautiful medium; it is arguably the most influential invention since the television. As it grows we can expect it to surpass the “baby (teenage.. parent.. grand parent..) sitter in a box”. Offering “web ready” features on new models means even our TV’s have accepted second place to the web. So what is one of the best facts about the internet? It levels the playing field between business giants and “Main Street America”. What does a person see when they visit your website? It is a statistically proven fact that you have less the 10 seconds to capture the attention of your audience before they move on to your competitors. This is why it is vital that you in-list the services of a professional web developer.. Not your friends, nephew who used FrontPage to complete a homework assignment.. Not a “Do it yourself” book.. A web development company that has extensive experience and an understanding of how to capture your audience’s attention quickly. With a properly developed site, there is no way of knowing if you are a 3 person crew or a 100,000 strong or if you have a 100 sq. foot storefront or isle upon isle of product. It boils down to the look, feel, and functionality of your site as well as how it portrays you as a business. Stop throwing your money away and use it where there is the most value – in a FULL, MULTIPLE PAGE web site. Contact graphXevolution today about your web design. We can provide you with a web presence that not only sets you apart from your competition but propels you into the new age.. 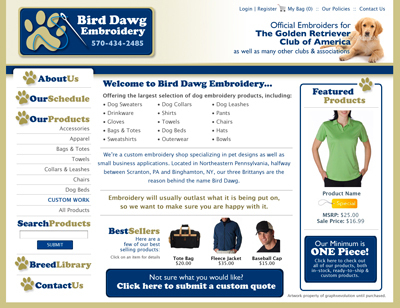 The internet age..
Our latest e-commerce website development project will be for Bird Dawg embroidery, a custom embroidery shop specializing in canine embroidery. The website will include a full shopping cart for customers to order off-the-shelf items and a breed library featuring the endless designs offered by Bird Dawg. Initially, a custom quote form for customers to submit custom specifications will be available and in the future the potential to include an interactive custom quotation system will be included. Check out the initial design to the right and stay tuned for the final project, scheduled to launch Spring 2010.